Biography & Genealogy: John Warner Lyell, Class of 1859: Born- 1838. Matriculated from Warsaw, Va. At VMI 4 years. Military Record: Entered service at Warsaw June 4, 1861 in what became Company D, 47th Virginia. Elected Captain (Date of rank June 6, 1861). Elected Lt Col (date of rank May 1, 1862). Sseriously Wounded in Action (head) at Seven Pines. Wounded in Action (head) at Frayser's Farm. Wounded in Action (groin) at Fredericksburg. Wounded in Action August 19, 1864 (lost Left arm) at Weldon Railroad. On court martial duty. Retired to Invalid Corps December 1864. Assigned to VMI faculty. Paroled Richmond County June 1865. Post War Career: Teacher; merchant. Taught math at VMI (with brief intervals while in Kentucky and Tennessee) until mid-1890s when he moved to Washington D.C. where he died. 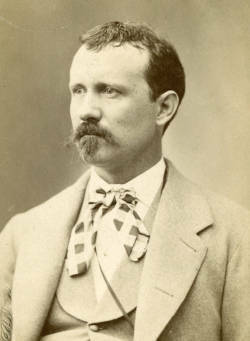 Died- October 16, 1902 in Washington D.C.